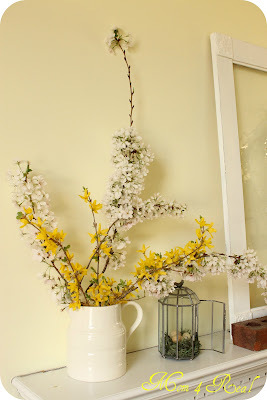 This is the first year that I have decorated my mantel for Spring, and I have to say, I adore it! 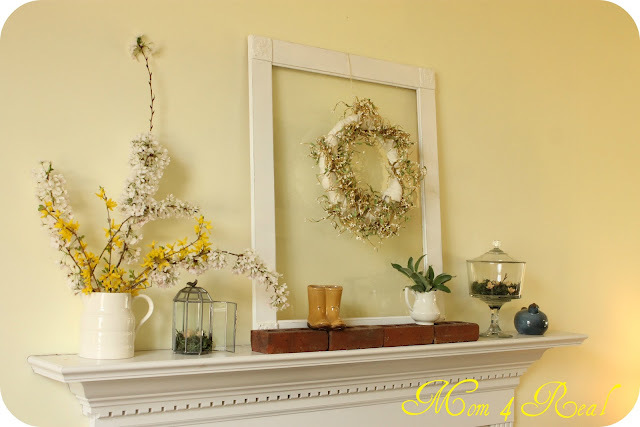 Spring mantel decor seemed a bit much for me until I got started, now I think I’ll be decorating for every season! I usually skip from Christmas/Winter right to Summer, but I have been so inspired by all of the lovely Spring mantels I have seen in the blog world, that I had to do my own! I started with one of the many white pitchers that my Grandmommy has given me over the years. I cut some forsythia branches from one of my bushes, and trimmed some blooms off of my sweet neighbor’s tree…with her permission, of course. Next, I added one of my favorite yard sale finds ever. I bought this beautiful little glass cage for 25 cents last year! 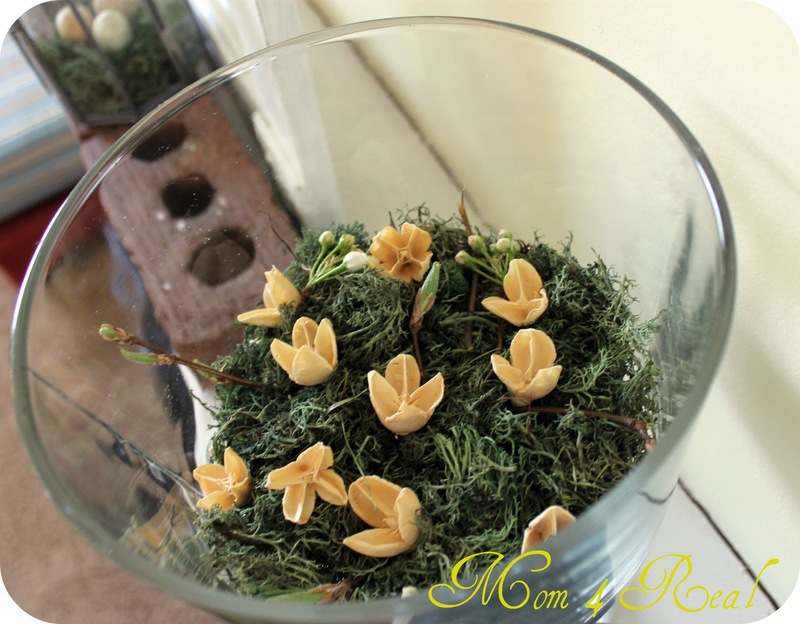 I put a little moss inside to make a nest, and added some small brown eggs. 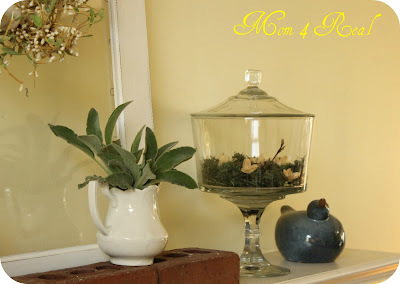 I filled this tiny pitcher with lamb’s ear, and added some more moss to the inside of my trifle bowl with some twigs and little pieces of potpourri. The blue bird was given to me by my Grandmommy years ago, and finally has a new home. Don’t they look like little eggs that have already hatched? Last, I hung a Spring wreath from a window frame, and added my little yellow boots that I love so much! I had all of these things around my house and yard, it is just amazing what you can do with a little inspiration! 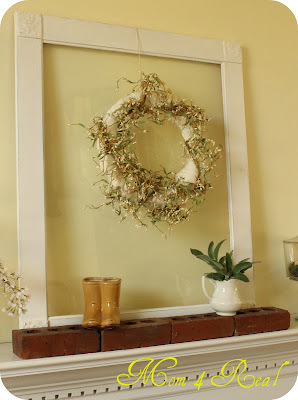 I love the simplicity of the wreath hanging from the wooden frame. It looks elegant. 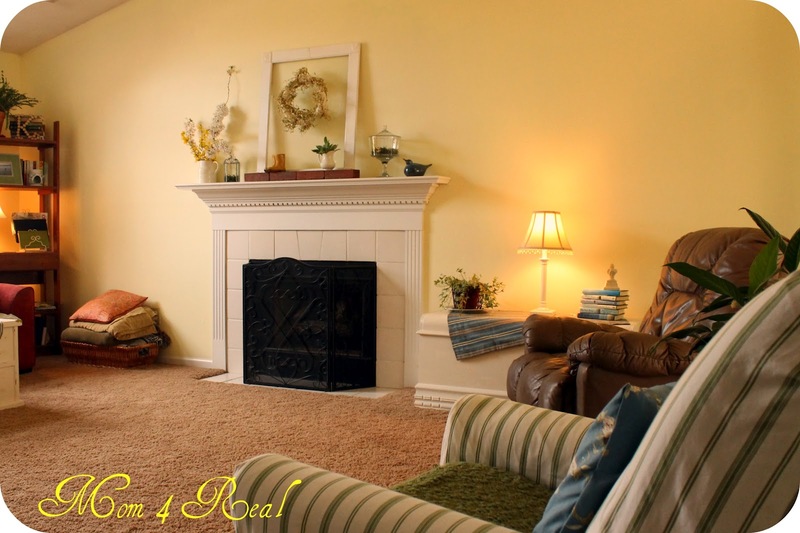 Overall I think the mantel is really original and eye pleasing. Don’t mind if I take an idea or two from you. Yes, they do look like little eggs that have hatched! It’s all so beautiful and springy! Jessica… you always make the prettiest things!! Everything is PERFECT! Darling!!! You have given me some great ideas. Adorable-I love the little boots. This is just lovely! Pretty and springy but not over-busy–I really like that. You did a great job with this!! Thank you so much for linking to Grace at Home. I really appreciate it! Oh, that looks so pretty! I have a bakers rack I think I should start using for every one else’s mantels! No fire place here, but that is so pretty! I love that wreath in the window frame!! Thanks for sharing at oopsey daisy! Hi, Jessica! Your mantel looks fantastic. I edited your thumbnail for you (it was turning up blank in the link party). If you could please add a link back to me within your post, I would appreciate it. Thank you! Your mantle looks amazing. I love the forsythia. Ours has not bloomed here yet. Your glass cage is awesome. 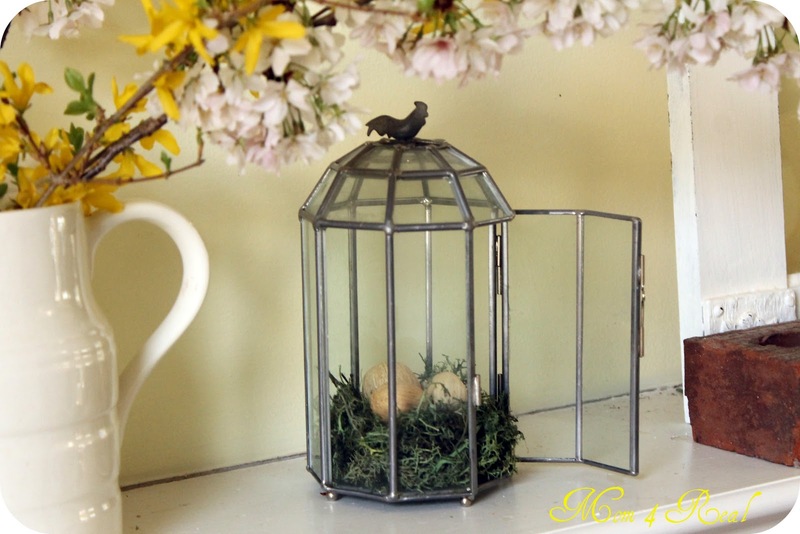 Stop by my blog for some spring decor. 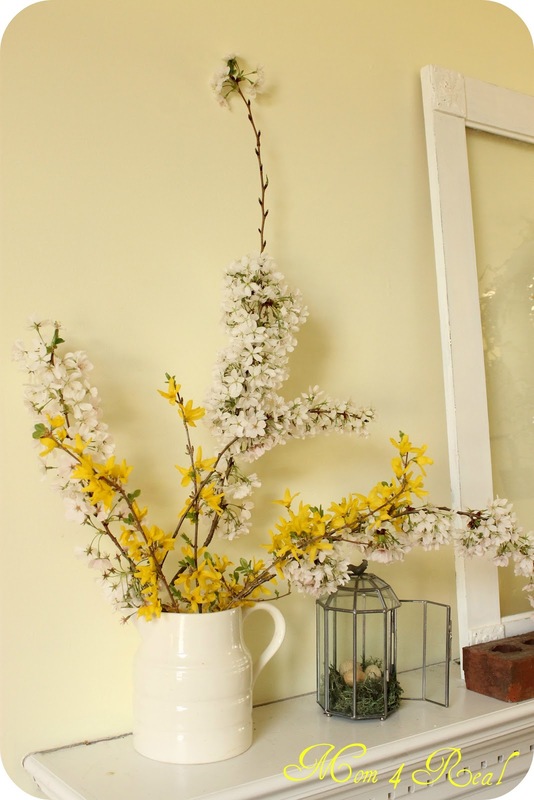 Your mantel looks very fresh and spring-y. I was hoping to decorate mine as well, but we have a TV sitting on it until the basement renovation is done. Visiting from Serenity Now’s link party. Glad to have found your blog! This is absolutely beautiful!!! I would LOVE to feature it on my Fireplace Decorating blog!! Please give me a shout if your interested. I am still new at this blogging stuff. I found you on thirtyhandmadedays linky party! 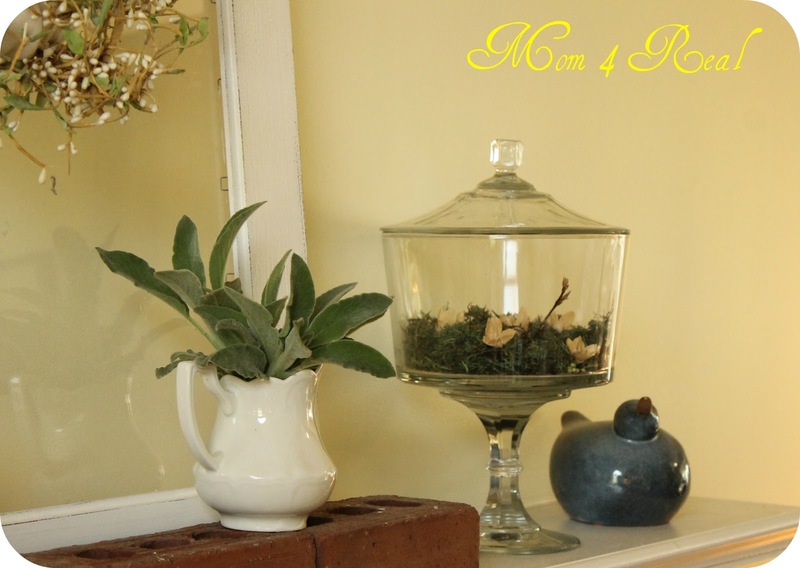 So loving your spring mantel. I love the simplicity of it, but still so very lovely and stylish. I haven’t even started my spring mantel yet, I’ve been painting, painting and painting. Can’t wait to get to the fun part. Very lovely. Thanks for sharing your creative inspiration at Sunday’s Best! Such a fresh and clean spring feel…very very nice!